Watching him mature – finally – one of the many memories of last season. Maybe you’re at the same juncture: bird season, kaput. Training, sure, even when the weather doesn’t cooperate. But it is a pale imitation of the real deal. Desperate to do something related to bird hunting and dogs, I paid homage to the chore gods by cleaning and putting my guns away. I put it off as long as possible every year, a feeble gesture that foretells the inevitable admission: We Are Done. Partly out of hope, during the season I leave my go-to shooters handy: safely locked away in the TruckVault because you never know when you’ll be near a birdy field! This morning, with little hope for another hunt in the foreseeable future, I slid them from their drawer one at a time, swabbed and oiled, then locked them away in the safe. It was the definitive admission that the season is truly and finally over. I know, it doesn’t have to be. There are plenty of “reasonable facsimiles.” A few days of preserve season here, more just north in Washington. Clay birds of all species down the road a ways. And training birds (not just pigeons) are now fair game year-round if you did the paperwork (I did). But kissing goodbye to the “real” season is always a bittersweet affair. Memories of dogs and places, good friends. Regrets at the places not visited, those who couldn’t make a trip, or a season. Spray, wipe, think about the missed opportunities. With each stroke of the rag, a destination for next year. How about you? Any field trial dates yet? Liked your “Okay, so now what?” Same here but I still might get one more hunt in at Fasen Jager. I have been keeping Chubby in shape by running her at Pine Haven and down Hope rd. Chubby had a real good season with woody’s, grouse and pheasants. She is like a machine. 110%. She is keeping me young. When it comes to keeping ourselves young, a dog is the best medicine! Starting to look at NAVHDA hunt test for fall, but it’s contingent on TV work, so no firm commitment yet. You? What does one do when your dog refuses the here command? He started to not respond last year, even to his e-collar. Does good in the yard just not in the field. Go back to the check chord and start over building back up to the e-collar once pup is coming without the chord. Give lots of praise for doing it right and don’t freak out when pup doesn’t come. Also, you want to give the command only once and then tug on the chord reeling pup in if you need to. Pup needs to learn your in charge no matter where you are. You want to do this in the field and build up to more distractions over time. Good advice Chris. I would only add that “praise,” especially early in the process, could include food treats. I tried the treat route. He would just sit in front of me. If I could get him to chase a bumper he may return it but drop it and run to sit in front of me. And, leave the check cord on him in the field until he gets the message THERE IS NO DISOBEDIENCE, only obedience. Left the cord on him in the field. I couldn’t get close enough to him to grab the cord to stop him from trapping birds. Is there a time to just let this dog be a dog at home and give up any hope of hunting him? Are you bringing him into the bird from cross-wind? That’d be my first suggestion. And for a while, I would hold the check cord the entire time, walking him into the scent cone. Unless he’s a real washout (I doubt it) he just needs to get a clue. Minimize the variables (thus, hold the cord) put the bird where you can find it fast, and make sure you’re coming into it from cross-wind so he’s surprised when he scents it – and will at least flash point. Don’t give up yet! Finding birds is not the problem. He finds live and dead birds. Feathers do not bother him at all. However, he started trapping live birds on our last hunt at the preserve. My major problem is his lack of following basic commands like heel or here. I imagined it would take less than 20 months to get these two ideas set in his brain. He will only walk at heel with a gentle leader collar and then he spends the entire time rubbing his face against my leg or anything else he can get near. This is after many thousands of hours of leash walking. With a harness or neck collar it is a constant battle with pulling to the point he will puke. BTW, we failed puppy school at Pet Smart over this one point. I would imagine that after 20 months of throwing various dummies he would get the idea I want him to sit at my left side. After many thousands of throws and like number of returns, he has never got the hang of this even with me moving him to the proper position and thanking him every time. He does, however, push between my legs and stands there with the dummy in his mouth. I have accepted this now. Or, as my wife would say, he has me trained well. Any hints besides continue working with him? Steve, owning wirehairs, I can feel your pain. Don’t give up as it sounds like he’s trying at times. 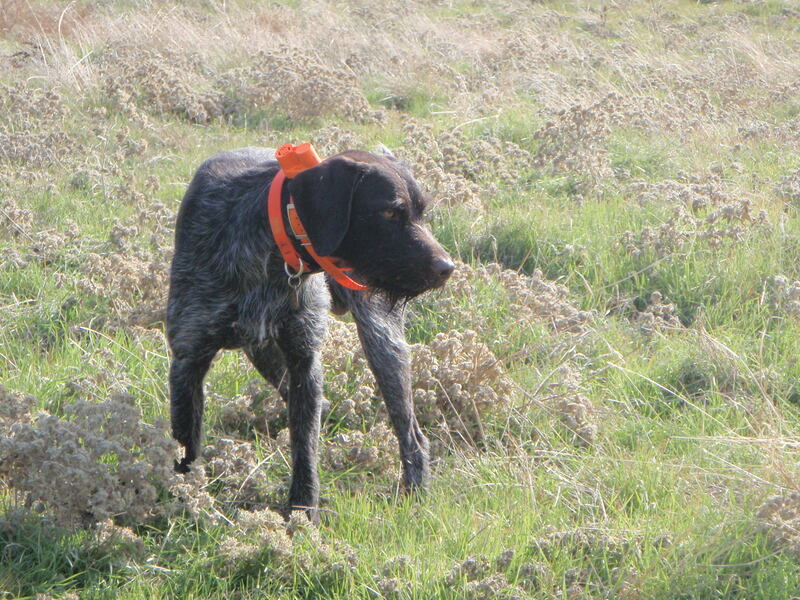 You might seek out a professional bird dog trainer for some advice, maybe a couple lessons. The heel thing is not the end of the world – it is over-rated in the bird-dog world. A pro will probably recommend force training to retrieve, and this could help in his obedience to all your other commands too – many believe it does. Keep us all informed – we’ve been there, too.